When St Benedict wrote his Rule, he built a number of periods for lectio divina or sacred reading into the monastic day. Lectio divina forms an integral part of the balanced approach to life developed by St Benedict. This balance is achieved through prayer, work, community and “holy leisure” as lectio is sometimes called. This form of prayer is a slow contemplative praying with the Scriptures which encourages those who use it to fall in love with the Word, ponder it in their hearts and allow it to transform their lives. The practice of lectio divina originated in the early Church among Christians who wished to contemplate the Sacred Scriptures. 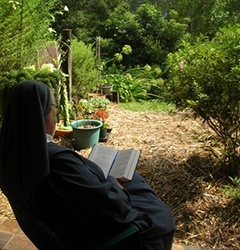 While it has always been a strong monastic practice, it is now becoming more popular with people in all walks of life as it offers such a simple method which promotes stillness, leisure, silence, peace and above all, union with God. On a number of occasions, Pope Benedict XVI spoke of his devotion to lectio divina and encouraged Christians to use it to deepen their love of Scripture and relationship with God. These steps however can be quite free flowing. Sometimes we might move through them in sequence but at other times we may move back and forth between them, all at the prompting and discretion of the Holy Spirit! Before beginning any form of prayer, it is always helpful to choose a definite time and place conducive to quiet and a degree of comfort. It is also good to establish a regular routine which helps us to be faithful to prayer especially when life gets busy or we are tired. Having “arrived” at our place and time, a simple centering ritual will still our minds and bodies and prepare us for prayer. Some people like to focus on their breathing using a mantra to still themselves, others use a chant or a hymn, others again use a favourite prayer or a ritual using the arms or body. You will know what works best for you! When you are ready, begin moving through the four steps gently and prayerfully. While there are a number of ways to choose the passage from Scripture to focus on, the most common practice is to use the readings from the Lectionary for that day OR to slowly work through a particular book of the Bible from beginning to end. Both of these methods help to avoid simply choosing passages we like or beginning prayer not knowing what text we will focus on. While the use of Sacred Scripture is most common in lectio divina, other religious texts can also be used such as readings from the saints or poetry. Visio divina (divine seeing) is also becoming popular whereby we use the same four steps while contemplating God’s Word to us through creation or a magnificent piece of art. Begin by reading the passage slowly and gently either aloud or silently. It is helpful to savour each portion, constantly listening for a word or a phrase which speaks to our hearts. It is helpful sometimes to read the passage again or we may find ourselves going back to certain words, repeating them, memorising them and allowing them to sink in more deeply. There is no right or wrong to this slow reading or indeed to any of the steps of lectio. They are all simply ways in which God teaches us to listen and invites us more deeply into God’s presence. As the word “meditation” suggests, this step invites us to move from the head to the heart allowing us to ponder more deeply on the words or images which speak to us or stay with us. Sometimes we just continue to sit with these words, ruminating on them or we engage our minds and reflect on what God might be saying to us through them. They may begin to bring up memories or concerns or ideas or even thoughts about the day ahead or the day gone. We may feel that these things are distractions but they are all part of us and we can give them to God and allow the light of the Word to shed new levels of meaning on them. This is the step in our lectio when we speak to God in response to the Word or the thoughts which arose during meditation. This dialogue or prayer can take many forms – thoughts, ideas, writing, images or simply sitting in deep silent awareness of God’s presence. Again, there is no right or wrong way to do it! The important thing is to speak to God just as we would with someone who knows and loves us. In this step, our words and thoughts subside and give way to silent presence where we rest in God’s embrace. This experience may last for only a short time or for a longer period depending on the individual and the grace of God. It may be different each day. In contemplation, we allow God to take over and we simply let go and receive. When contemplation concludes, we move back into our reading again or, if we feel our lectio has finished, we gently thank God for this graced time and leave our prayer space taking the Word with us as we go. Lectio Divina is a long term activity with no other goal than to accept the invitation to be in God’s presence by praying the Scriptures. If we are faithful and constant in this form of prayer, it will bear much fruit in our lives. As we read the Word, meditate on the Word, pray with the Word and contemplate the Word, we will be transformed by the Word.